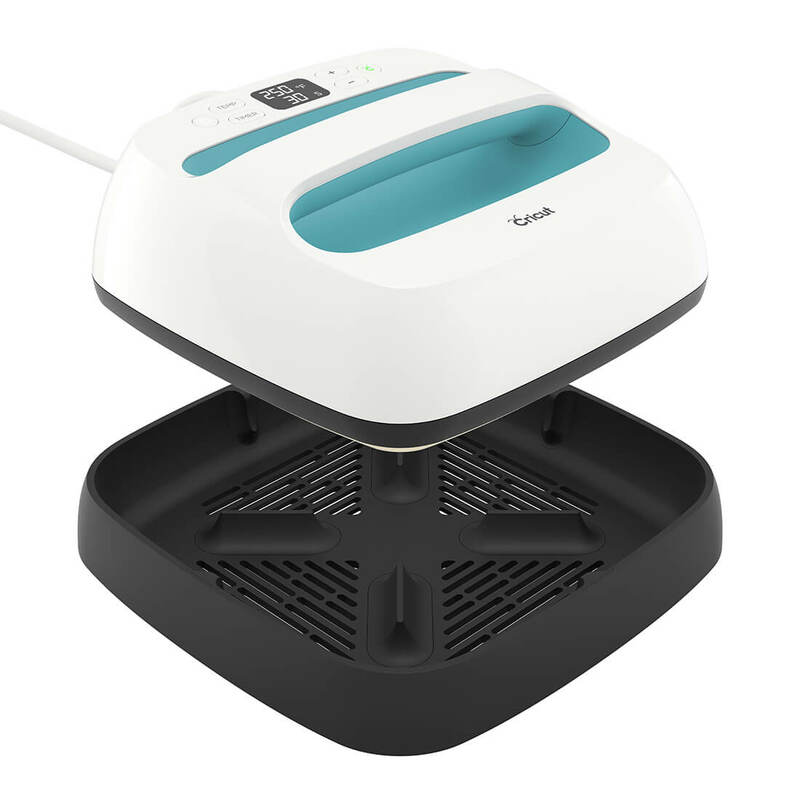 Ideal for the home crafter, this Cricut heat press is the perfect mix between iron and traditional heat press. It produces excellent quality prints, is safe and easy to use, and is reasonably priced. It's not quite as capable as a large scale, professional heat press, but it's portable, compact and fantastic. At the Cricut Mountain Make-a-thon conference last week, CEO Ashish Arora introduced the cutting machine we’ve been waiting for: the Cricut Maker. But that wasn’t the only big announcement. The Cricut Easy Press was also introduced — and it promises to be the next big thing to hit the heat press industry. It’s not yet available for sale — but we’ve compiled this introductory guide to the product so you can be prepared when it finally does go on sale. 1 What is the Cricut Easy Press? 2 How Does the Cricut EasyPress Work? 4 Should I Buy the Cricut Easy Press? We like to think of the EasyPress as the perfect compromise between an iron and a heat press, when it comes to using HTV — heat transfer vinyl — and iron-on vinyl. While using an iron to transfer your vinyl to fabric is super convenient and cheap, it’s not nearly as effective as using a heat press. But heat presses are expensive, bulky and can be a pain to bring out and use every time that you’re using HTV. The Cricut Easy Press is somewhere in between. It’s small and compact like an iron, but efficient and effective like a heat press. And at $149.99 on the Cricut website, it’s also the perfect compromise price between iron and heat press. How Does the Cricut EasyPress Work? While we’re yet to get our hands on the EasyPress, the one thing we’ve heard from people in the know is how gosh darn easy it is to use. That’s automatically a big step up from a normal heat press. One of the major downsides of using an iron to apply your heat transfer vinyl is the fact that it’s hard to know exactly what temperature it’ll reach, and adjusting that temperature can be a bit of a guessing game. Not so with the Cricut Easy Press. The heat is fully adjustable up to 350°F, and the plate will evenly heat to your desired set point. That means no random hot or cold spots and a consistent hot finish for your design. There’s nothing worse than accidentally burning half of your design, while the other half still isn’t properly stuck down yet. Another feature allowing for utmost precision with the Easy Press is the set timer up to 60 seconds. Once it’s fully counted down, it’ll beep to let you know that it’s time to remove the press. This is usually a guessing game with HTV, particularly if you’re just using your household iron. It’s nice to be able to work within exact parameters with the EasyPress — for one thing, it cuts down on wasted materials and wasted time! And if you’re thinking, that’s all well and good but how the hell am I meant to know what temperature and time I need for my material, that’s no problem either — simply consult the included Quick Reference Chart for Cricut’s suggested settings. Once the beeper’s sounded and you’ve removed the press, remember that you can always put it back on again if the vinyl starts to peel off when you try to take the backing off. Another point to note is how quick the Easy Press works — up to 60 seconds. Normally, we’re faffing around with an iron for a long while, testing and trying again to make the HTV stick! Probably the major benefit of going for the Cricut Heat Press over a professional heat press (aside from the price difference) is the fact that it’s so maneuverable. The grip handle on the top of it makes it easy to lift in and out of the Safety Base, as well as to apply consistent gentle pressure. And while it’s a nicely compact little machine — the heat plate measures just 9″ x 9″, the handle makes it easy to slide the press across larger projects and designs with no problem at all. Plus, the fact that the handle is on top ensures that hands are kept away from the hot plate — very important when it can reach a top temperature of 350°F! We know that we’re not the only ones to accidentally burn our fingers on a heat press platen. Another benefit that the Cricut Easy Press has over a traditional heat press is that it’s nowhere near as bulky. The heat plate itself is just 9″ x 9″ and it comes with an awesome Safety Base that makes it perfectly easy to store without accidentally burning a surface. We think we’ll keep ours either on a shelf or in a desk drawer when we get our hands on one. One of the most hyped features that the Easy Press is touting is the fact that it’ll ensure your HTV designs last through multiple washes — even the most intricate and layered designs. Of course, it’s impossible for us to make an accurate judgment on this without properly testing the product first, but if true — this could be a real game changer in the heat press industry. One of the reasons why many people choose expensive and bulky heat presses over an iron is the fact that they’re much more effective, with transfers still in position even after repeated washes. It can be very difficult to achieve these same results with a normal household iron. This will be the first thing that we’ll test and report back on when we get ours. Should I Buy the Cricut Easy Press? We know that for some of our readers, the Easy Press will be everything they’re waiting for. If you do a lot of work with iron-on vinyl and HTV, this will be a very exciting future purchase for you. Likewise, other crafters will be able to see that they probably wouldn’t get much mileage out of the product. If you only very occasionally do heat transfer vinyl cutting, you’ll probably choose to stick with an iron. But there will be plenty of people in between as well. We’re not sales people. We don’t think you should rush out to buy the Cricut Easy Press if you’re not really going to use it. If you’re curious about it, we’d recommend waiting until you read a few reviews from ‘normal’ people using the product to see if it’s a good addition to your craft room. We’ll be back soon with our balanced review of the product as soon as we have had proper chance to test it out. Heat transfer vinyl is notorious for being tricky and getting 100% right — especially if you don’t have a professional heat press to hand. Most home crafters use a simple household iron to transfer their designs on to fabric, but these are notoriously unpredictable, often heating unevenly and even burning your vinyl if you’re not careful. There’s simply no unpredictability with the Cricut Easy Press, however, and it turns HTV from a tricky craft into something fun and easy. We’ve already detailed how to use the Easy Press above, but suffice to say that it’s so intuitive even a child will be able to get the hang of it quickly. Following on from the point above, we love how safe the Easy Press is to use. We’ve all been burned by hot irons and even the best heat presses can be dangerous in the hands of children and the unexperienced. This Cricut heat press, however, is super easy to manage thanks to the big handle on top and the Safety Base below. The auto-shutoff feature also makes sure that everything is only hot for as long as you need it — there’s no way that little hands are getting burned using it. Of course, the main reason people will be buying the Cricut Easy Press is for how effective it is. Thanks to the evenly heated plate, your design will completely adhere to the fabric in under 60 seconds — that’s the same degree of performance you can expect from a professional heat press. That means that you’ll never end up with one corner of your design flapping away from the fabric while another corner is being singed thanks to an unevenly heated iron. Promising to adhere your HTV in less than a minute, the Cricut Easy Press is a huge step up from a regular household iron. This is thanks to its ability to reach 350°F. We were also surprised by how long and how hard we had to press down with our iron — particularly for large or intricate projects — but the Easy Press makes sure that you’ve adhered and tidied up in a matter of minutes. No longer is using heat transfer bound to take up your entire afternoon! This is good news if you’re using the Cricut heat press with kids or people who get bored easily. The Cricut Easy Press has a 9 inch by 9 inch heat press area, which should be enough for most designs except specialist large ones — in that case, we’d recommend buying a professional heat press anyway. It’s much bigger than a regular iron and means that you should be able to heat the entire design area all in one go — something you can only do with the smallest designs when using an iron. Sure, you can buy larger irons that are specifically designed for these sorts of craft projects, but you’ll be paying a lot more money for it. Why not invest in a specialist machine like the Easy Press instead? Another thing we love about the Cricut heat press is how transparent it is — unlike with an iron or a manual heat press, you don’t have to worry about timings or temperature. You can set both the timer and the temperature exactly how you would like them and then forget about it while the Easy Press gets to work. There are two traffic light colors indicating readiness — the orange light shows that the heat press is warming up while the green indicates that it’s ready to be used. It’s fair to assume that most buyers of the Cricut Easy Press are using it for t-shirt designs and other fabrics, but the truth is that it’s much more versatile than that. It can also be used to transfer designs onto canvas, burlap, silk, wood and more — check out the recommend settings by Cricut for each individual material. If you’re someone who likes to craft on the road, or who hasn’t got a whole lot of room for storage, the Easy Press is an incredible alternative to something big and bulky like a traditional heat press. It’s lightweight at just 11 lbs and is neatly compact too — it could easily be slid into a bag or on to a shelf. 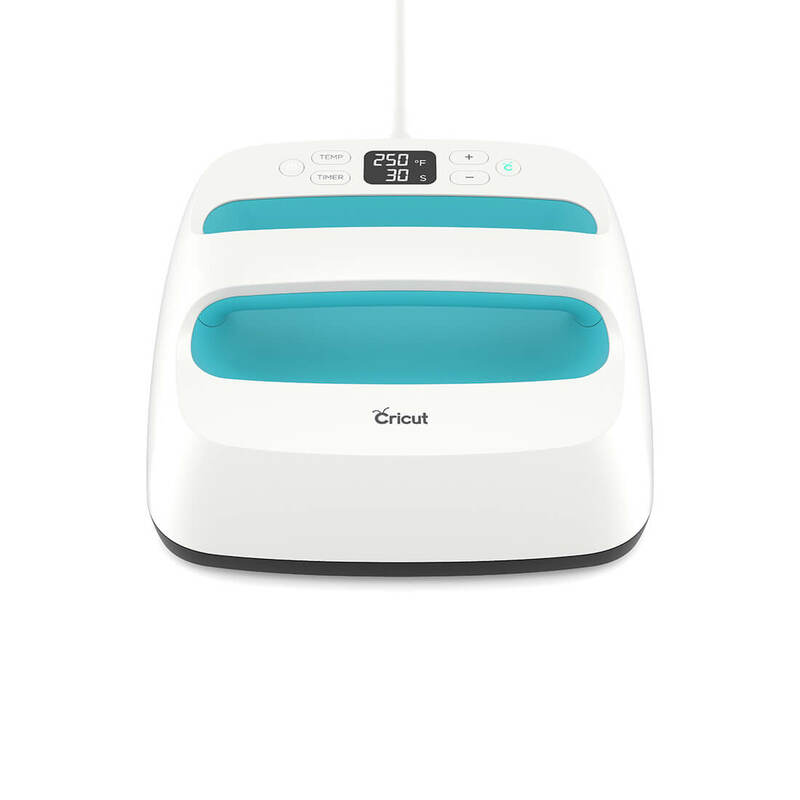 We would definitely agree that the Cricut Easy Press is an ‘iron meets heat press’, but it definitely doesn’t have the same capabilities as a large, advanced heat press does. If you’re doing large numbers of T-shirt transfers, say, or running a business, the Easy Press probably isn’t up to the job. It can only do one at a time, in an area of 9″ by 9″ and only reaches 350°F. If you’re a home crafter, that’s absolutely fine — the Easy Press will undoubtedly be a great and useful tool for you. But if you need something that’s prepared to be a workhorse for you, you’d be much better off spending a little more and investing in a proper heat press. Having said that, we were very impressed at the quality and accuracy of the prints made by the Cricut Easy Press and when it comes to this or an iron, this wins every time. Will you be buying the Cricut Easy Press? When will the Cricut Heat Press be available in Australia please? Does it work for sublimation?